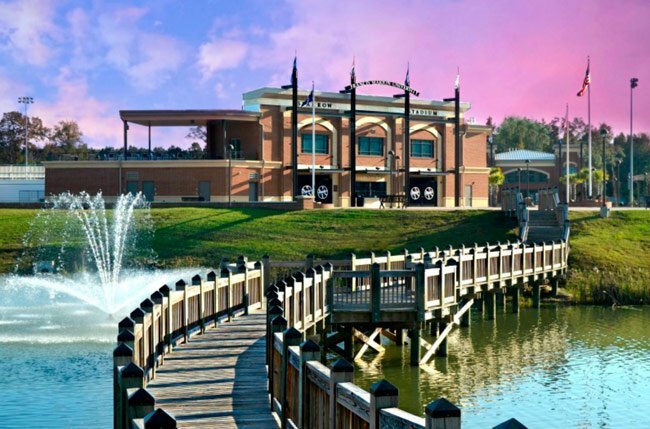 Francis Marion University in Florence is the only state-supported liberal arts college in the Pee Dee region. The school began as a freshman center for the University of South Carolina at the Florence County Library in 1957. In 1961 the college, called USC Florence, was established on 100 acres of a former cotton plantation donated by the Wallace family. 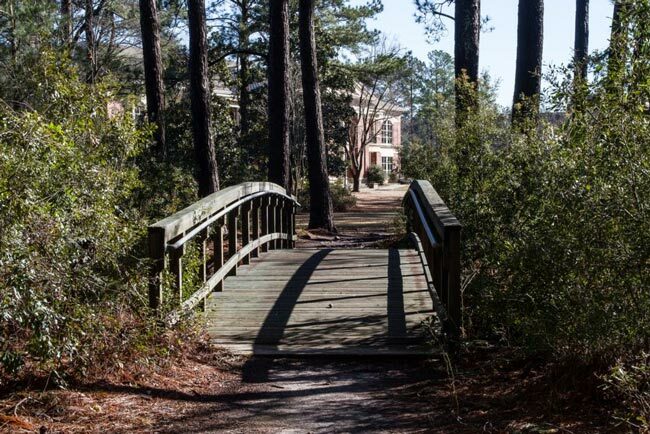 In 1970 the college became independent of USC when it became a four-year institution, Francis Marion College. The Wallace family property included the grand home that would become the president’s house (below). The antebellum-style home was built as a plantation house in 1836 by cotton planter J. Eli Gregg of Gregg Plantation. Though it burned at some point in the 1920s, the home was restored in 1924 by Mr. and Mrs. Joseph Wilds Wallace, Sr. When descendants of the Wallaces donated the house along with land for the school in 1960, the building became Wallace Hall and classes were held here. 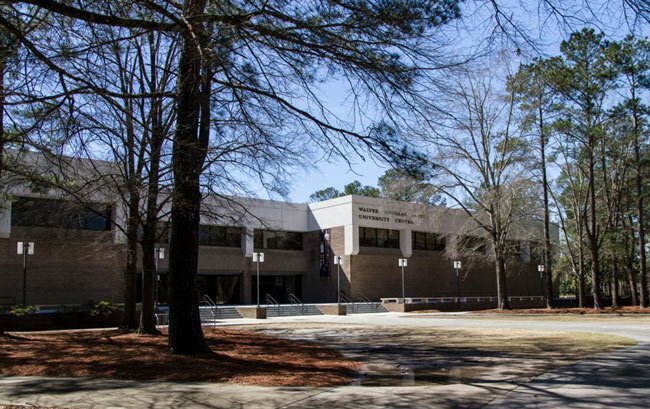 When the University of South Carolina at Florence became Francis Marion College in 1970 with the support of then-governor Robert McNair, the building was transformed into administrative offices until becoming the home for the university president in 1983. By 1992 the school had obtained university status, and the home remains a residence for the university president. It is known as the Wallace House. 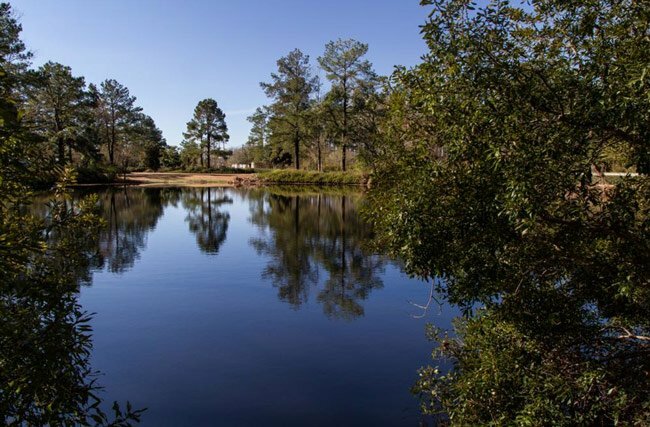 The campus now encompasses between 300 and 400 acres which include diverse ecosystems such as hardwood forests, pine forests, and bottomland forests. Trails wind through this campus of modern buildings, providing students and faculty with a natural oasis in the midst of higher learning. An arboretum is in development on campus and will include native species and rival those of larger universities when completed. A five-acre lake also graces the campus, leading students from the Lee Nursing Building to the Griffin Athletic Complex, completed in 2012. The campus is an eclectic mixture of plantation remnants, contemporary architecture, and natural settings. Because the university was founded in 1970, most of the buildings on campus reflect the architecture of that era. The Walter Douglas Smith Center, seen above, was built in 1974 and is named for Francis Marion University’s first president. It currently houses everything related to student life, including recreation, career development, and the campus bookstore. An unusual feature of the campus is the presence of two slave cabins, built in the early 1830s for the Gregg Plantation. Originally there were eight such cabins on the Gregg property, and these two remain. Made of hand-hewn timber, the finely-crafted cabins were likely built by the slaves themselves. They have been moved twice; once in 1870 and again one hundred years later to make way for campus construction. These two log houses were built before 1831 to house slaves on the Gregg Plantation. They were among seven houses of similar construction placed on opposite sides of a “street” leading to the plantation house. After the Civil War the houses were moved to a different area of the same plantation, where the residents took up farming for wages and subsistence. The houses were occupied until the early 1950s. These former slave houses, originally almost duplicate in design, illustrate the early practice of mass production of unit dwellings. Black craftsmen and artisans, using the same craftsmanship that went into elegant plantation owners’ houses, did much of the skilled labor in Southern plantation buildings. The craftsmanship shown in these dovetailed, hewn logs is usually not attributed to work found in slave dwellings. These small houses incorporate many of the same architectural elements found in larger Southern homes. The open front porches covered by roof overhang and supported by pillar posts, the gable roofs, and rear additions are all typical of the region. These houses were moved sometime before 1870, and again in 1971 for the construction of the Francis Marion University Library. Today both houses stand in an uncultivated field at the edge of the woods.